One of the frustrations when birding while working a full-time job is the timing of rare or unusual birds. I don’t normally flake-out on important appointments or max out credit cards to chase down birds around the state or country, but I will make a long day trip on occasion, providing it doesn’t unduly risk my employment. Getting the Bahama Woodstar and to some degree, stumbling upon the Kirtland’s Warbler on workdays this spring worked out because of their relative nearness to the office. But when rare birds are found a little more afield, it can get frustrating to not be able to “chase” them until the next day off. Luckily it worked out today that when a rare bird (the presumed 2nd county record) was seen a little farther away from work, my afternoon had stalled out (both my boss and project lead were out). Jim Eager sent out a text that a Bahama Mockingbird was seen at Playalinda Beach, and Camille and I were in the unusual position to be able to chase it down on a workday afternoon! 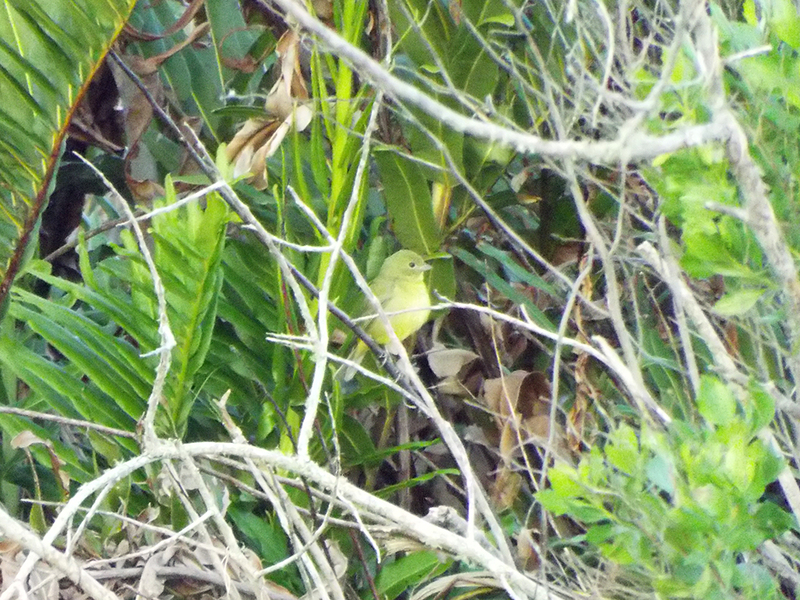 The first bird we saw (apart from the ubiquitous Boat-tailed Grackles) was a mockingbird, but it seemed oddly plumaged. 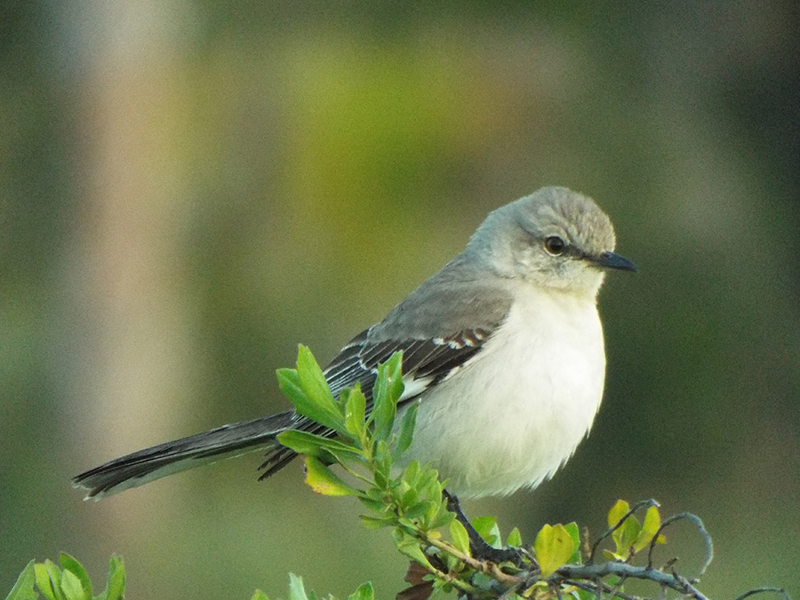 While not showing all the field marks of a Northern Mockingbird, it retained enough of that “look” to make us uncertain of the Bahama Mockingbird identification. This bird was seriously heat-stressed. I noted how much browner the wings of this bird looked compared to other immature Northern Mockingbirds I’ve seen. Read on to find out what this might mean. We weren’t sure about what a juvenile Bahama Mockingbird should look like, but we tentatively considered our find a “success”. But then, another birder played a recording, to get familiar with what we might hear should the bird sing, another mockingbird flew into a nearby shrub, and this one was clearly not a Northern Mockingbird and even sang back to us, confirming the ID as a Bahama Mockingbird! While this bird did in fact sing for us, that’s not what you’re seeing here. This bird is panting hard to stay cool. The heat-index was miserably high. As the bird moved about, we could see some feather separation on the breast. This is often an indication of a brood pouch when a parent bird is on the nest with eggs or young. 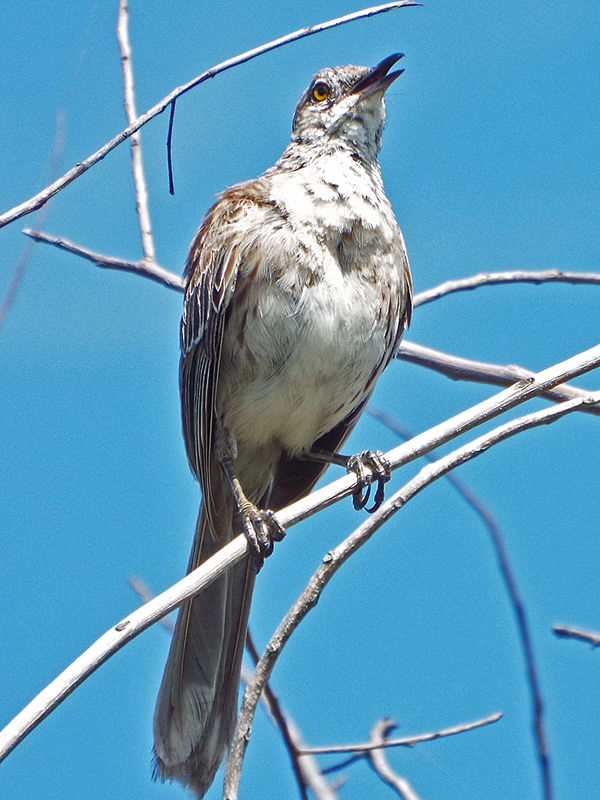 In addition to the possible brood pouch, the side streaking and (barely visible) malar stripe (moustache) that mark this bird as a Bahama Mockingbird can be seen. Meanwhile, the first bird we had seen was intermittently flying in and out of an area in the scrub that was visible to us. As we (and some other birders) advanced in toward the brush, the second bird flew down in front of us and then fluttered out its wings and slowly tilted down onto its side, as if it had fainted or was injured. It actually first tilted one way and then the other, in quite a melodramatic performance. 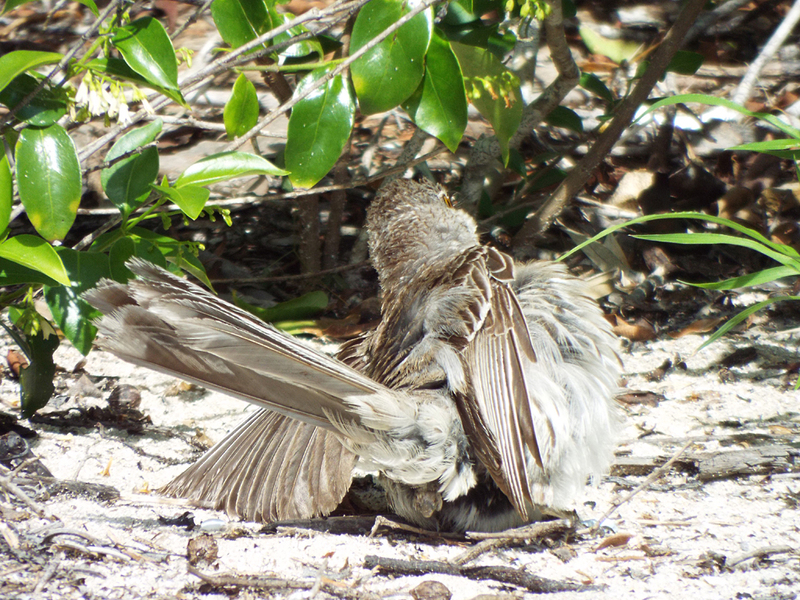 An adult Bahama Mockingbird doing its best to act injured to lure predators away. After several seconds of this display, seeing as we continued to look in on the other bird, this one hopped up and promptly began eating bugs in the sand. Birds will do this to lure predators away from a nest, eggs, or young. 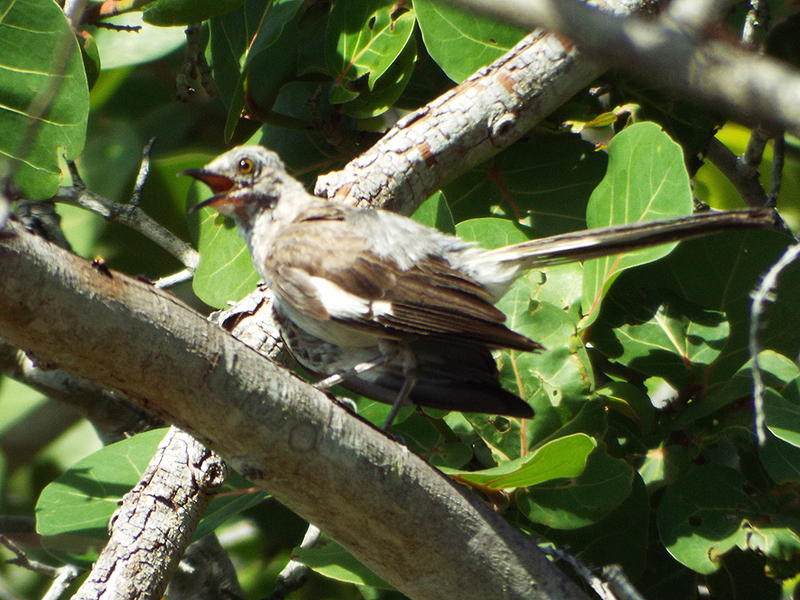 If you take into consideration the brood pouch, the injury display, and the slightly-odd looking fledgling/immature bird, it seems probable that this Bahama Mockingbird has mated with a Northern Mockingbird and produced at least one hybrid offspring. This is not unheard of, as a general rule, but it may be the first recorded instance of this happening in Brevard County. Ultimately, that may be up to the Fish and Wildlife biologist and the Florida Ornithological Society Records Committee. Another view of the immature mockingbird. The broad white wing-patch all but rules out a pure Bahama Mockingbird, but the other circumstantial evidence and plumage aberrations make for a compelling case for hybridization. Whatever the final determination is, it was nice to be able to have an opportunity to “get” this life bird and document possible breeding activity of this species. 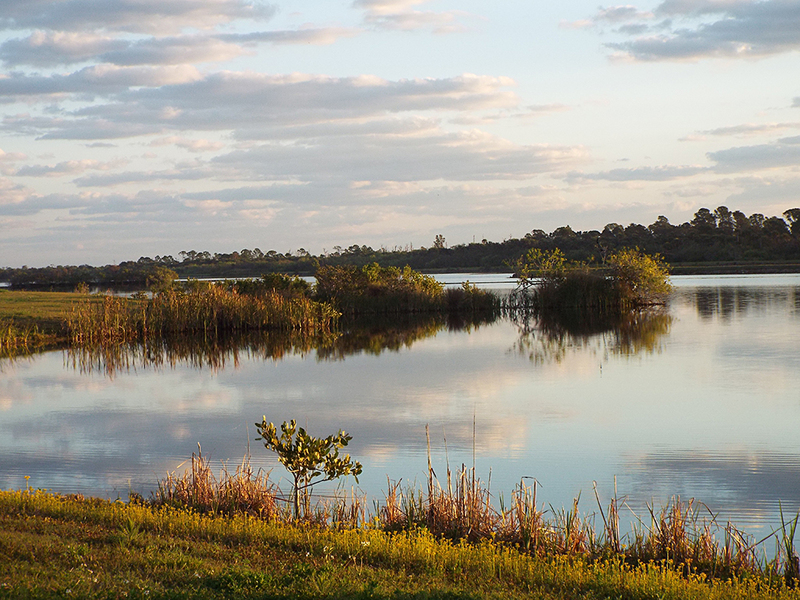 Last weekend I made the trek over to the Lake Apopka Wildlife Drive [map]. I haven’t birded much outside Brevard County this spring. This was my first visit to the lake since last Fall. 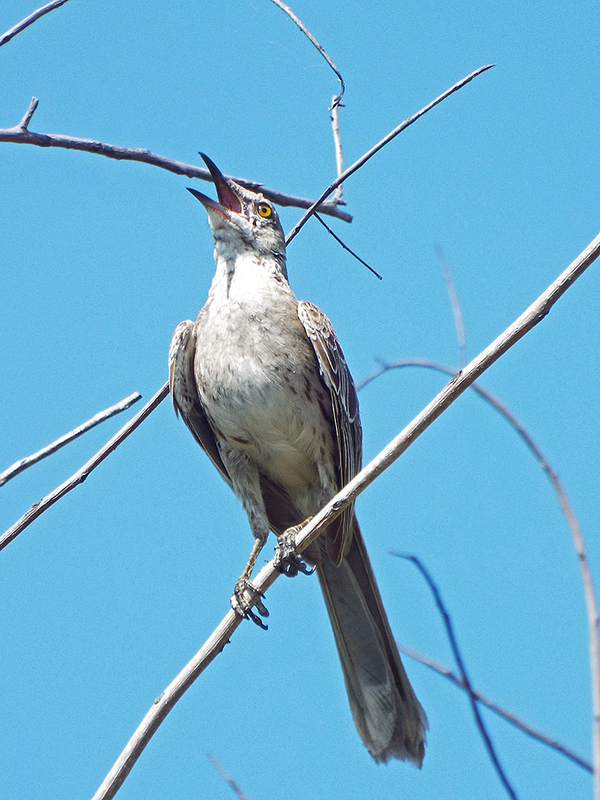 With temperatures rising into Summer, birdwatching outings like this are generally easier on the body, even in the car with the AC turned off. The area between the entrance gate to the North Shore Restoration Area and the Wildlife Drive proper is referred to as the “Gate Area” and even has its own eBird hotspot. I usually forget this and all my eBird reports get lumped into the Wildlife Drive hotspot. I am probably not unique in this. 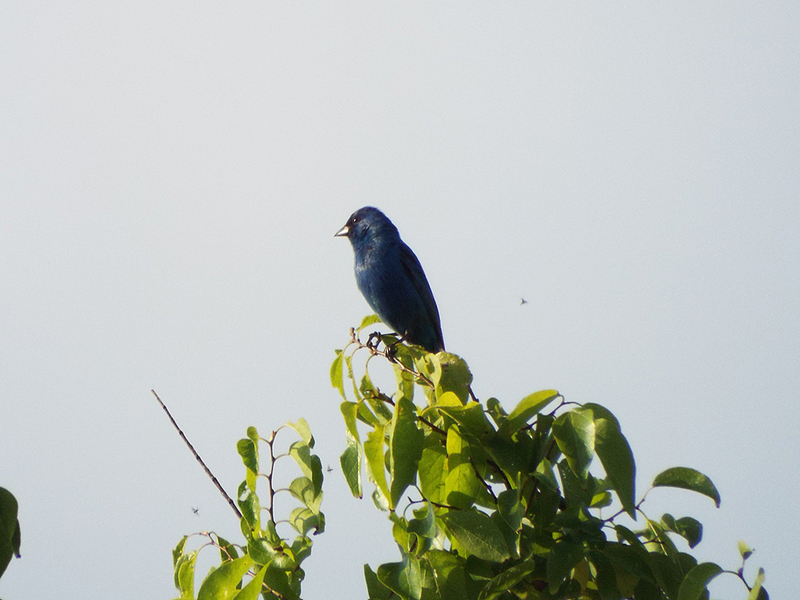 In any case, in the Gate Area it is typical to find both Indigo Buntings and Blue Grosbeaks. Sure enough within 30 seconds of driving in, there they were. 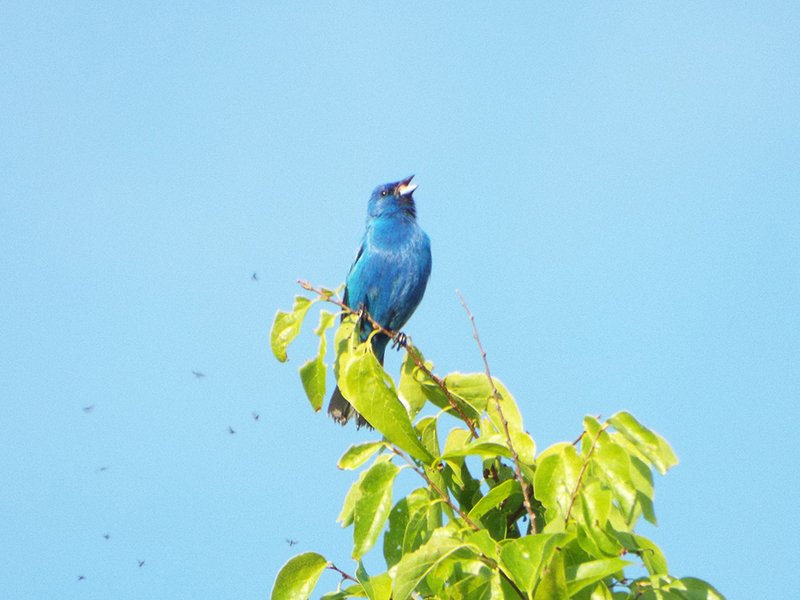 A male Indigo Bunting in partial sun, backlit. Notice how his blue plumage is dark and unsaturated. This is the same bird as above, but in full sun. Seeing these birds early in the morning with passing low clouds made for interesting changes, as illustrated in the two photographs above. While most colors on a bird, like red, yellow or green (and even black or white) result from light reflecting off pigments in the feathers, birds that are blue look that way for a different reason. Instead of a “simple” reflection off pigments, blue colors come about because of a particular way that light reflects through a feather’s 3D structure. Red and green light interfere and cancel themselves out inside the feather, while blue light gets amplified before coming back out. The result is that brilliant blue you see. But that also means that when there’s less light, due to backlighting or clouds, the light coming into and out of the feathers lowers the color blue levels. This is even obvious in more “common” birds, like Blue Jays. On really overcast days I joke and call them “Grayish Jays”. OK, not the pinnacle of humor, but hey. Here’s a link to a Smithsonian Magazine article that explains it if you want to know more. 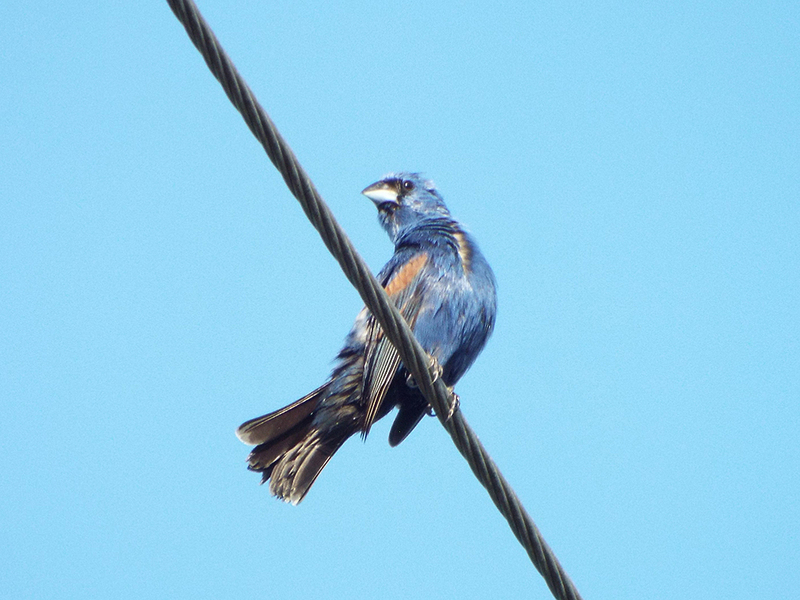 This Blue Grosbeak isn’t quite in full breeding or adult plumage – he had quite a bit of brownish gray streaked throughout. That heavy bill (gros is French for big) and brown wingbars are diagnostic field marks for this bird. 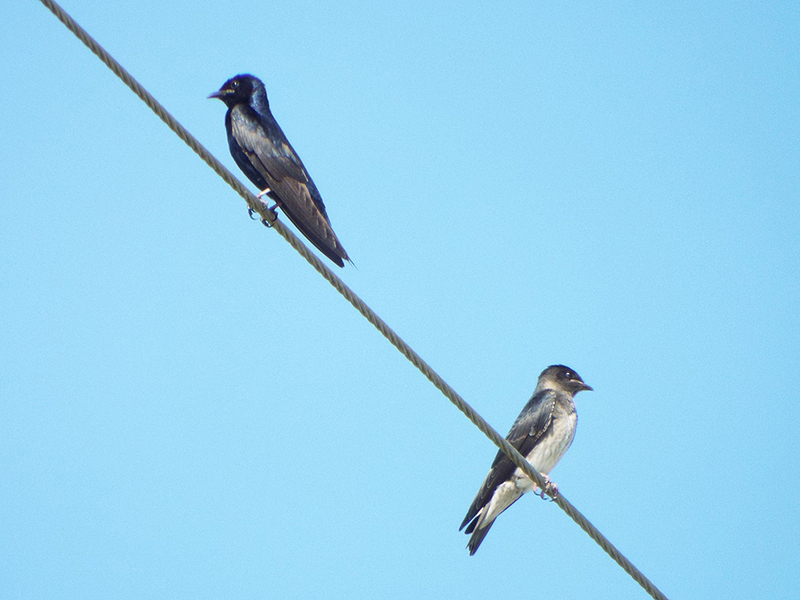 The Wildlife Drive can also be counted on for swallows, especially Barn Swallows and Purple Martins. Often less common swallows, like Northern Rough-winged, Bank, or Cliff Swallows can be found. The martin babies are fledged but still depending on parents for much of their food. I have to chuckle at this photo. It looks like this Purple Martin couple had an argument and aren’t speaking. In fact, they had just been cozied up to each other but their fledgling brood swooped past, looking for a meal. They are about to divide and conquer. This won’t last long. Martin parents are pretty strict in getting their babies to fend for themselves. Florida has continued in a mostly dry pattern but we’ve had some showers and storms lately. 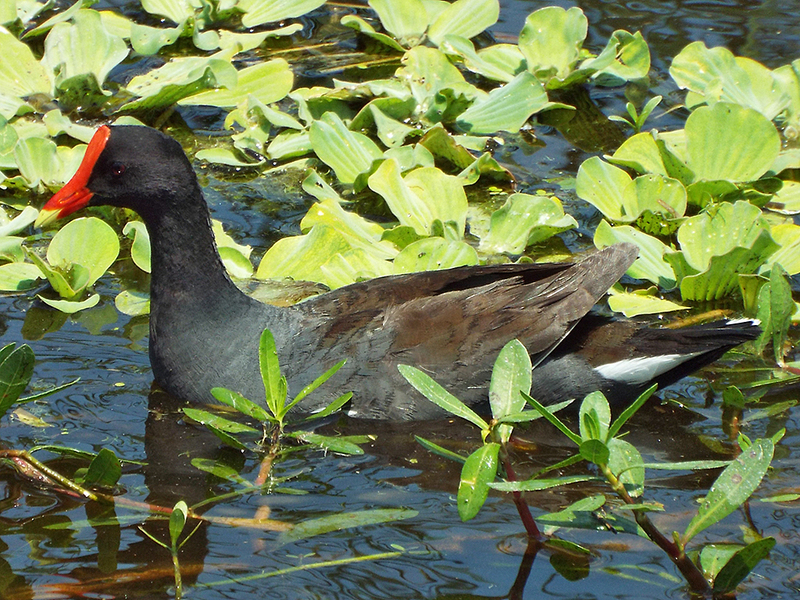 The wetland areas around the Lake weren’t dry; almost anywhere there was sufficient water there were Common Gallinules, many with chicks of various ages. This female gallinule had chicks nearby (I could hear them squeaking), but they stayed wisely hidden in the adjacent weeds. Black-necked Stilts were present as well. Although I didn’t see any chicks, I did see a few of the birds engaging in faux injury displays and diversionary flights. This indicates to me that there were probably some chicks around but mostly out of sight. These birds, as well as the numerous Boat-tailed Grackles and Red-winged Blackbirds were reason enough to smile and enjoy the morning. I even had a quick look at an Eastern Towhee. 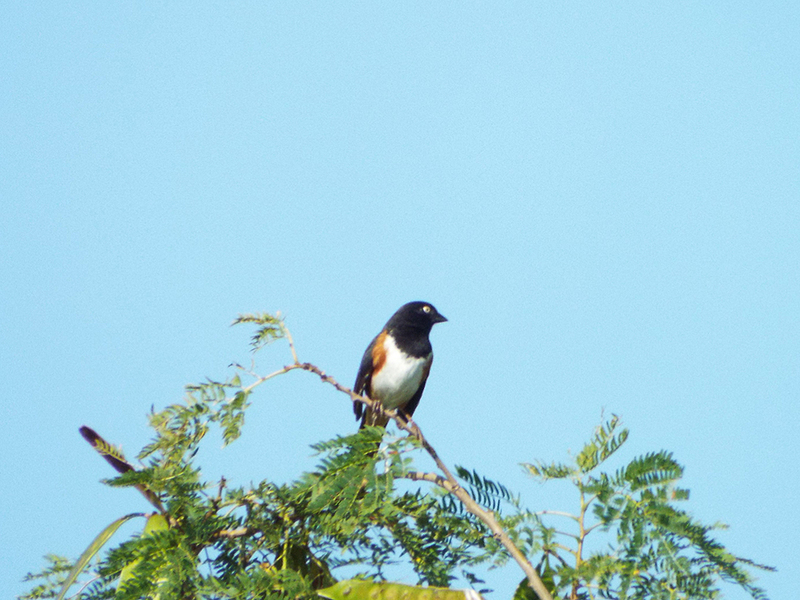 This towhee was singing his heart out. This specific location usually has a towhee in spring, but I can’t be sure it’s the same bird. The weather was unseasonably hot and as the morning wore on the number of active birds diminished. I did see a pair of Orchard Orioles and caught brief glimpses of Least Bitterns and Fulvous Whistling-Ducks as I made my way along the eighteen-or-so kilometer (eleven-or-so mile) drive. While it’s not unusual to see a Swallow-tailed Kite or two in the skies by the lake, Mississippi Kites are a bit less common. It was nice then to see one quickly glide across the skies as more buntings and grosbeaks sang along the road toward the exit. Seeing kites in flight is similar to watching ballet. There is beauty, grace, agility, strength, and speed. In a flash, this Mississippi Kite was gone from view. As I neared the end, I saw some vehicles had quickly pulled off the side of the road to the west of the sod fields. One couple was walking rapidly to the side of the road with a scope – a sure sign of seeing something remarkable. Initially I thought about stopping and heading over to ask what they were tracking. Here’s the thing about birding in Florida: sometimes out-of-state birders will nearly run each other down to get a good view of a Limpkin or a pale-form Red-shouldered Hawk – birds that are rare and exciting for them but not quite so for the locals. For this reason, I did not immediately pull over myself to see what was causing the commotion. I carefully drove around the next corner which looked across to the area they – and by now others – were checking out. On some large brush piles I saw an afore-mentioned pale-form (or “Florida Form”) Red-shouldered Hawk hunting lizards on the ground. Satisfied that I had seen what the commotion was, I completed the drive before heading for home. I was especially happy with my blue feathered friends I saw that morning. To my dismay, I found a way to be blue myself the next morning. It turns out that on those very same brush piles a Fork-tailed Flycatcher was seen. This is another rare bird for Florida; one that had been seen the previous week in Clewiston (near Lake Okeechobee) but I was unable to make that long drive at the time. To add insult to injury, it turns out I had likely driven by a White-faced Ibis earlier in the drive. White-faced Ibises are also rare in peninsular Florida, though a more common visitor than a Fork-tailed Flycatcher. 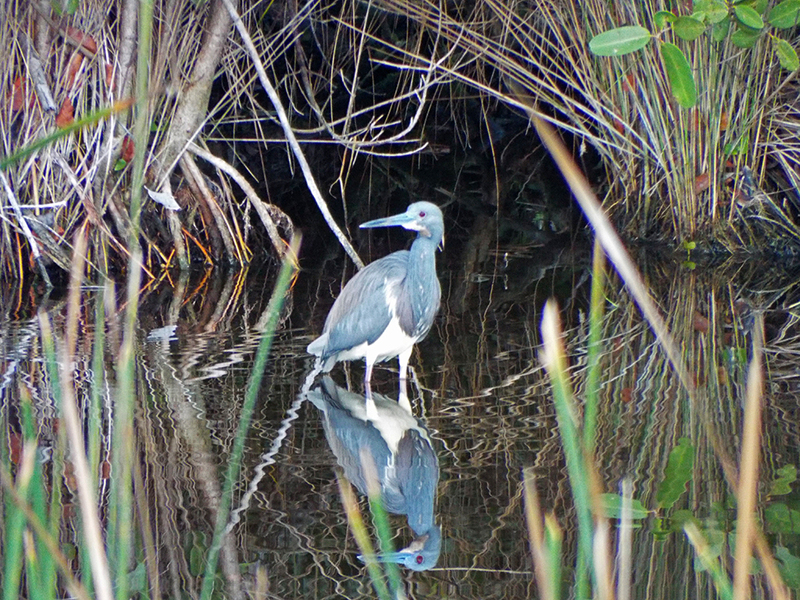 I had seen a White-faced Ibis at Lake Apopka several years ago, but passing by two Florida rarities in one afternoon was a little disappointing. Reports of both birds are still coming in, including this past weekend but I just didn’t have the motivation to make the two-hour drive out there again (plus the weather was much more uncooperative). We’ve had several days of much needed rain but this makes birding, even from one’s car, difficult. The lessons I learned is this: trust your gut and if there’s any smidgen of doubt, pull over! Even it if had “only” been the Red-shouldered Hawk instead of the flycatcher, it would have been a nice view, a special moment with other birders, and a chance to welcome visitors to a favorite hot-spot. What else could matter as much as that? Hey everyone! 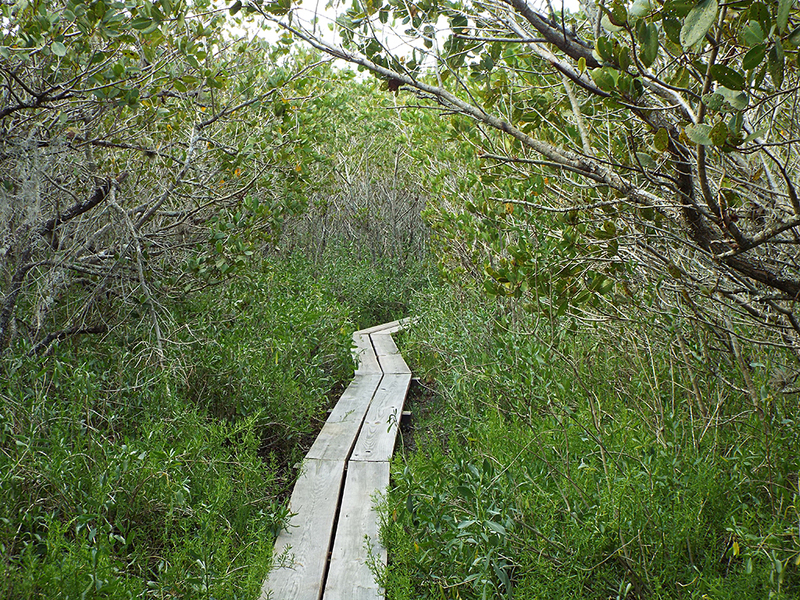 Enjoy these photos taken from this past weekend’s adventure to Pine Island Conservation Area. It’s been quite a while since I visited this spot, and it did not disappoint. 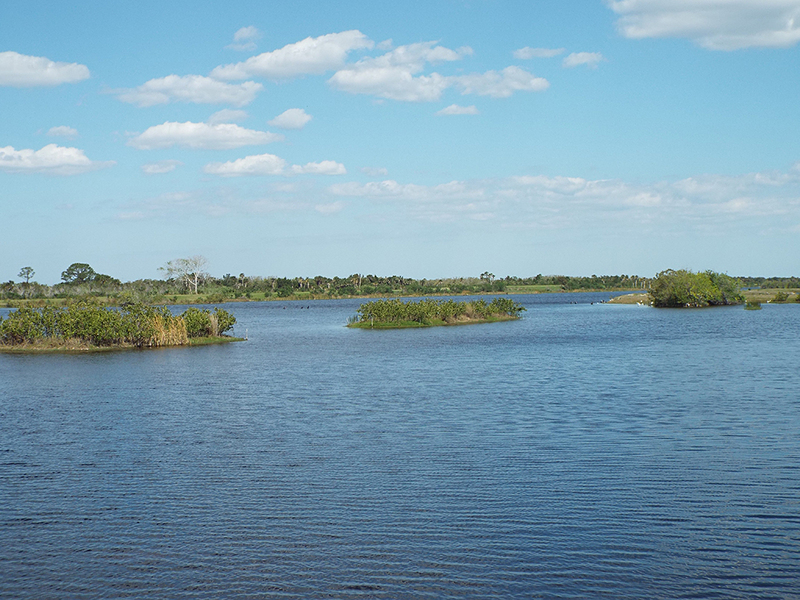 Although not really an island itself (at least not any more), it is on Merritt Island, very near the Kennedy Space Center (the Vertical Assembly Building is easily visible) and the wildlife refuge. The north pond does support decent recreational fishing. There were very few alligators than usual. 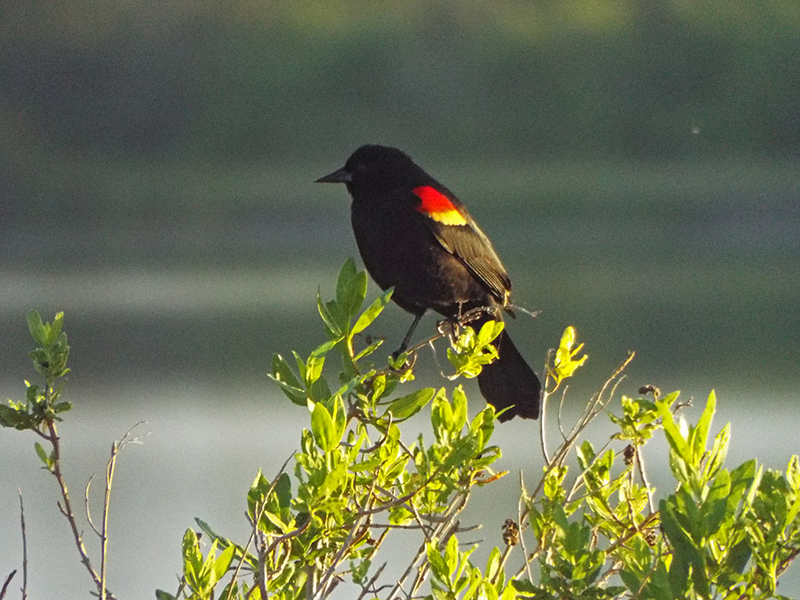 A male Redwing Blackbird, showing his epaulets. He was singing and displaying for a mate. Female Painted Bunting; one of very few green birds native to the US. Male Tricolored Heron in full breeding plumage. This individual is showing no throat stripe. This Swamp Sparrow almost had me fooled into thinking it was a White-throated Sparrow. You can tell it was a chilly morning by how puffy this Northern Mockingbird is. 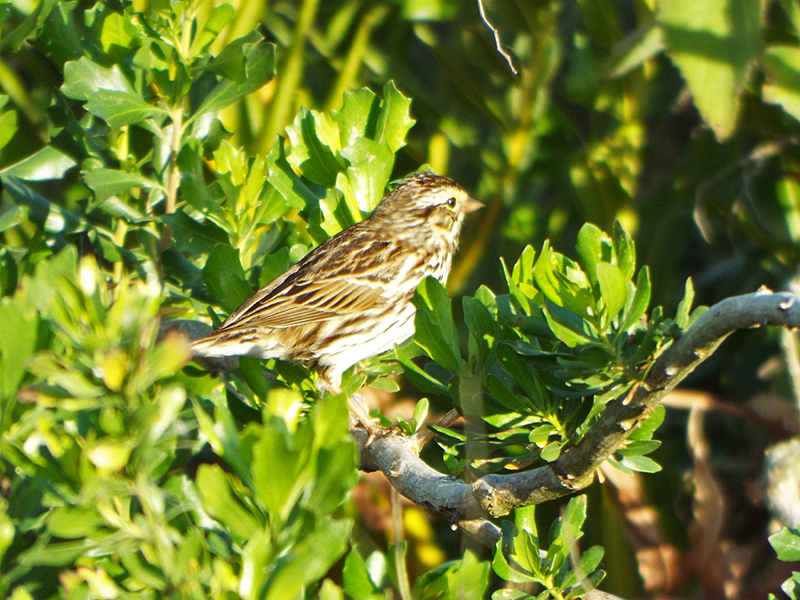 Savannah Sparrows are fairly common in central Florida, but it’s always a pleasure to see them. A Turkey Vulture using its large wing area to warm up for the day. 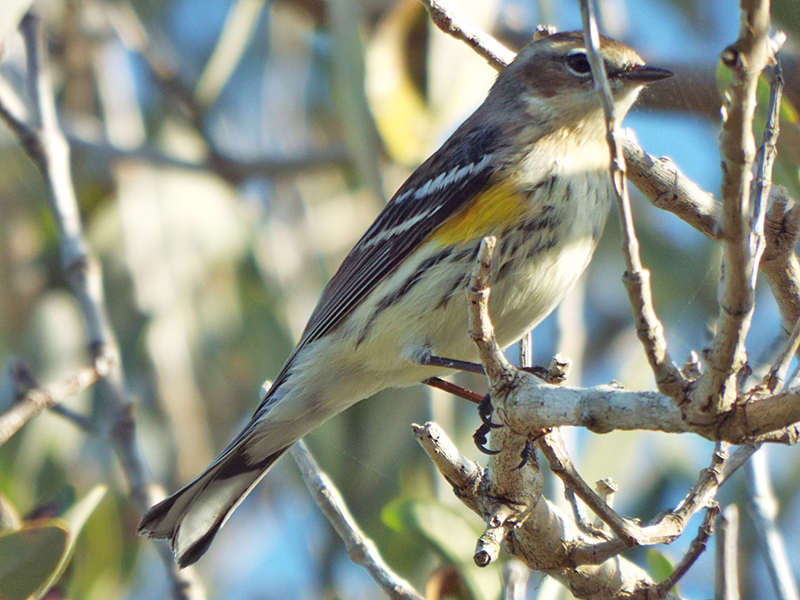 Yellow-rumped Warblers are still hanging around. Soon they’ll be north, in their breeding range. It’s a little hard to see, but this breeding male Tricolored Heron is less blue than the one pictured above, and he has a white stripe from belly to chin. By late morning, it had warmed considerably, but the day was gorgeous. A raised wooden path provides dry access to a wildlife blind (with no wildlife to see today, sorry). 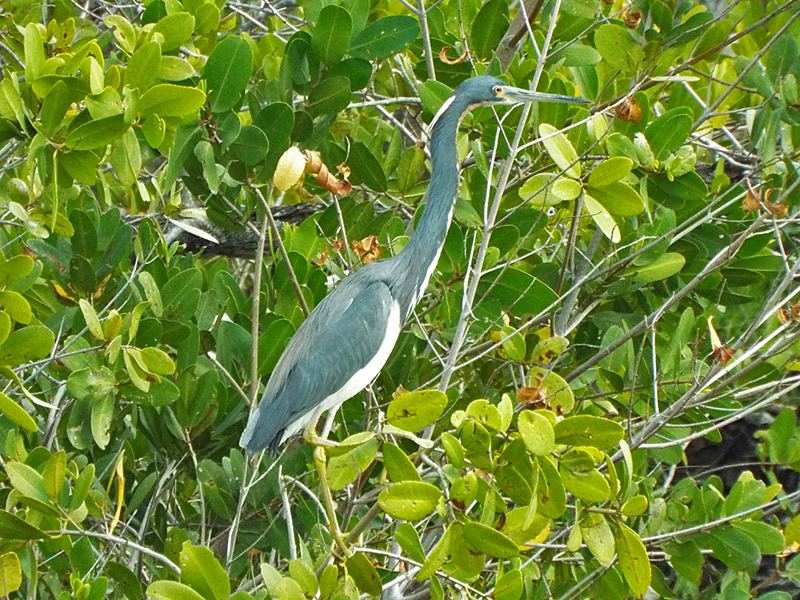 My thanks to Jim Eager for helping me properly identify the really blue Tricolored Heron. I had not realized the variation in breeding males, and had almost committed to calling the bird a Little Blue/Tricolored Hybrid! 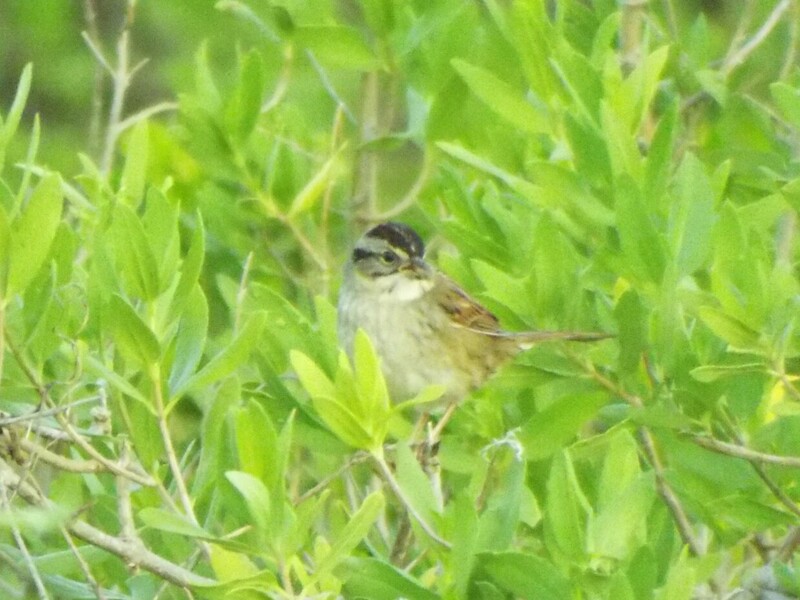 Also thanks to the members of the Brdbrains e-mail list for helping me sort out the Swamp Sparrow identification. I tell you what, sparrow ID is HARD, even for experienced birders. If you struggle with these “little brown jobs”, don’t give up and know you’re in good company. 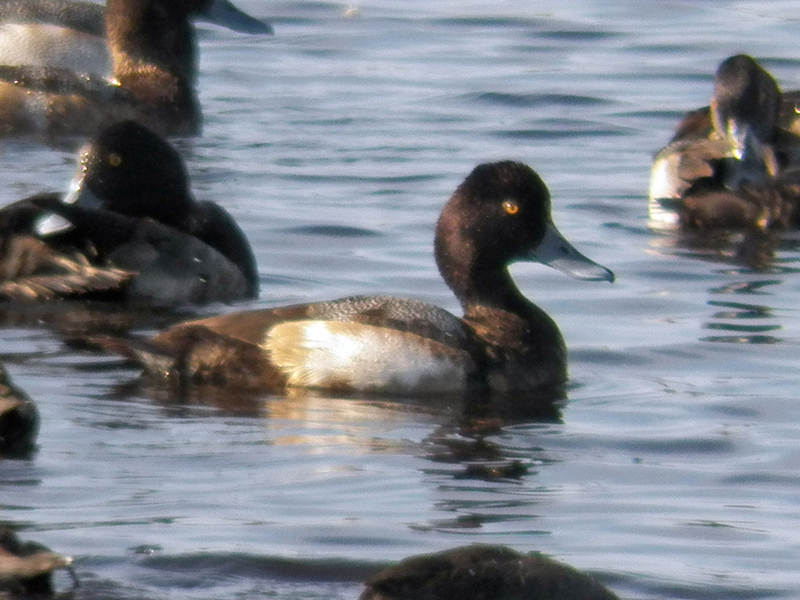 Two varieties of scaups frequent east-central Florida. Telling them apart can be a little challenging, especially if they are not seen together, but there are a couple of tips that might help. Greater Scaups generally have flatter or rounder heads, compared to Lesser Scaups. Lesser Scaups often have a slight crest or point at the top of the head, behind the eye. Head color is sometimes mentioned as a way to tell them apart, and in the photos below you can certainly see how the Lesser Scaup has a redder head. My experience in the field, however, shows that sometimes the head colors are almost indistinguishable. When seen from the front, Greater Scaups have a wider head bill and nail (the spot at the tip of the bill). The Lesser Scaups’ bills and nails tend to look “squished” sideways. 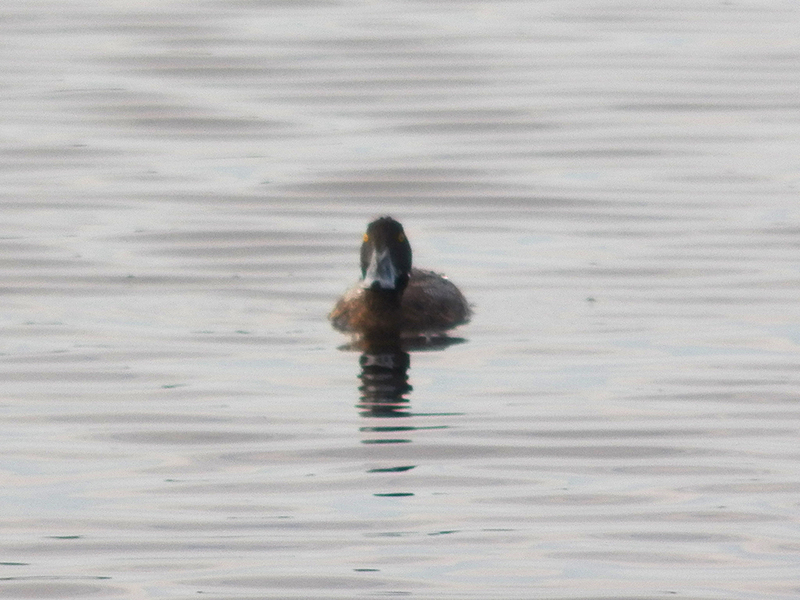 The photo below and to the right isn’t exactly head-on, but you can see how the nail is almost completely round, while the nail on the Greater Scaup (on the left) is a bit wider than it is tall. There is certainly overlap, and viewing angle can complicate things, but at least it is another ID tool that might help with a positive identification. Remember, not all birds can be positively identified every time. I have ambiguous bird sightings almost every time I’m out (birding or just doing errands). For example, more subtle point between these two species is the amount of white showing on the sides when these ducks are on the water. 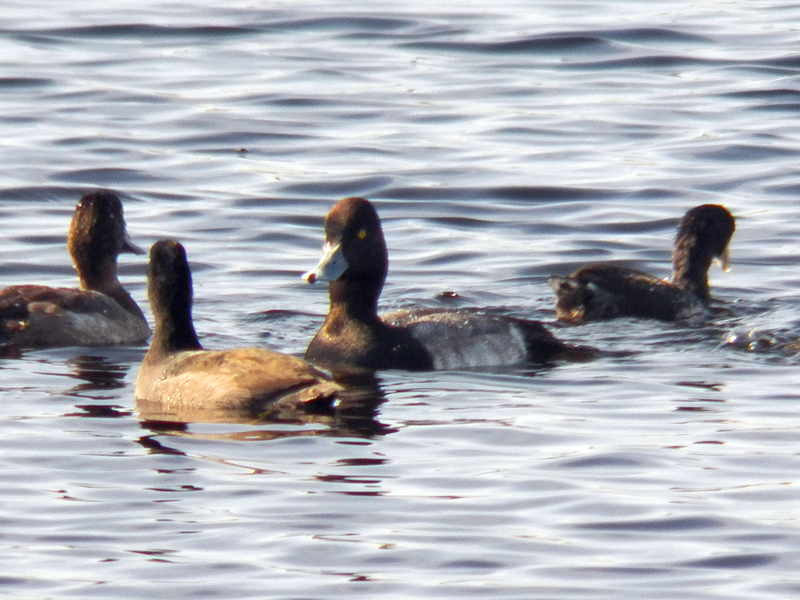 Normally, more white shows on the Greater Scaup, while less is evident on the Lesser Scaup. 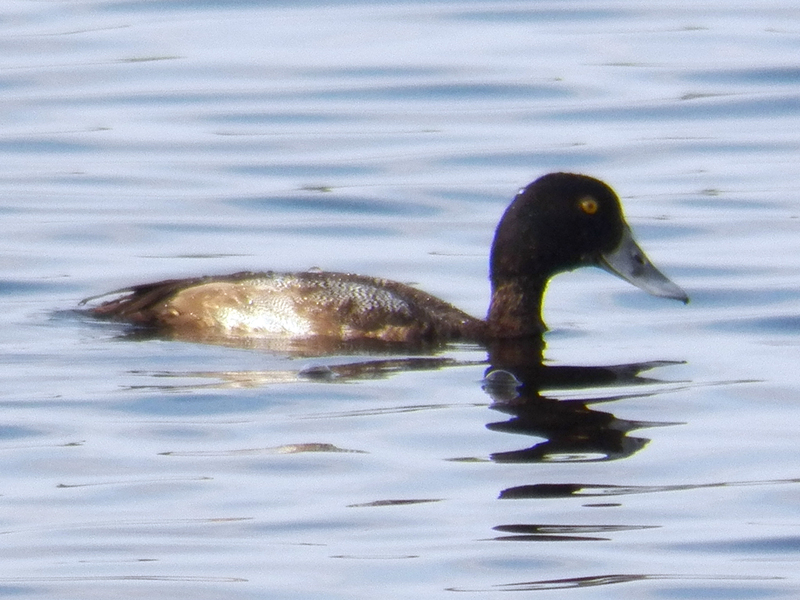 In the photos above, you can see more white on the Lesser Scaup. Trying to figure out what’s what is sometimes its own reward. The joy of birding is in the journey. I’ve done some further looking into the raptor I saw over the courtyard pond at work today. 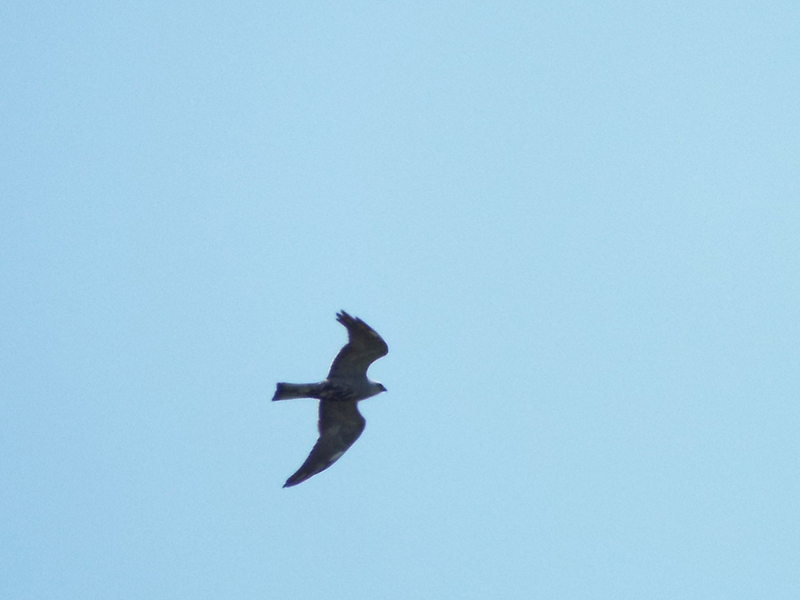 Based on the field marks I saw and the shape of the bird, the closest match I can find is the White-tailed Kite. I didn’t notice the eye-color, but the white body and wings with some black near the leading-edge underwing matches little else. My perception of the size was a bit larger that what a White-tailed kite is described as, but size is sometimes hard to guage in the field. I am not certain if I should count this as a positive ID or not. If so, it’s a lifer for me and the 98th bird species this year. I am not sure what to think.